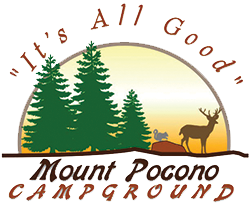 "It's all good" at Mount Pocono Campground. A family-oriented campground with 191 Seasonal campsites on 43 wooded acres--for "Big Rigs", campers, conversion vans and tenting. Amenities include: Big Rig Friendly (50 amp) sites; free WiFi; pet friendly with dog run; crystal-clear heated swimming pools; organized in-season weekend activities and camper rentals (park models) available.